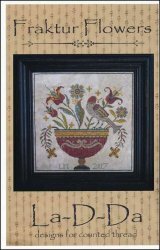 Fraktur Flowers [D6060] - $10.00 : Yarn Tree, Your wholesale source for cross stitch supplies. Cross Stitch pattern from La-D-Da. A colorful vase is accented with flowers and a bird perched on the rim. Stitch count 156 x 156.